Just like a single ant who's lost in the large expanse of Brazilian Casino Beach (Praia do Cassino, 250km in length, considered to be the largest beach on Earth), and felt as small as possible in surrounding space, we humans are experiencing similar sensation when it comes to space and especially time. But, contrary to ants, we have the ultimate tool, called science, that is allowing us to see beyond the horizon. If we could place ourselves in ant's shoes, we would find clues and evidence all around us and, metaphorically speaking, no matter of large quantities of sand grains, we would know that we were on the beach. 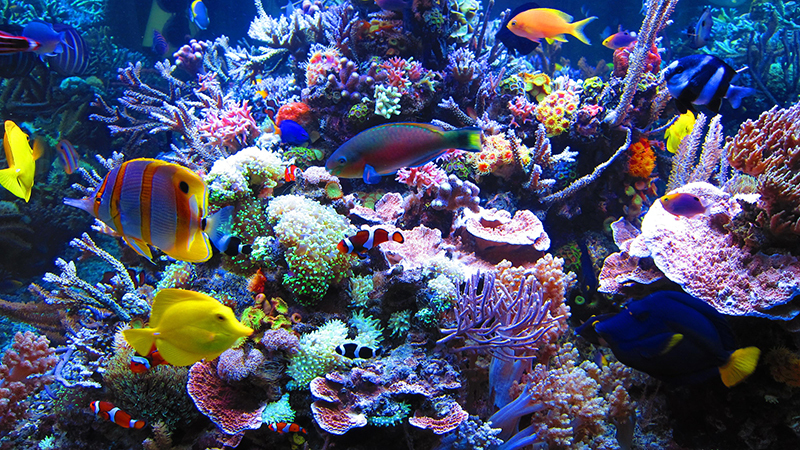 And with time, when it comes to history of life, all the clues lie in fossil records of coral reefs. The main study, performed by J.E.N. Veron in his publication "A Reef in Time", identified five periods in Earth's history with major extinction of corals that built reefs. In all five periods, fossil records of the reefs needed millions of years for reef systems to recover fully and these five periods in time are now called "Reef gaps". With simple words, five major events attacked life on Earth in previous 500 million years and corals successfully recorded them all. We now recognized these time periods as "The Five Mass Extinction Events" that successfully wiped out 99,9% of all species that ever evolved and lived on Earth. That includes all marine life, plants and animal species crawling on the surface. We and everything that moves and consider themselves alive today are just descendants of those 0,01% that survived five great cataclysms. Here's a short glimpse to all five events and their cruel aftermath. 1. 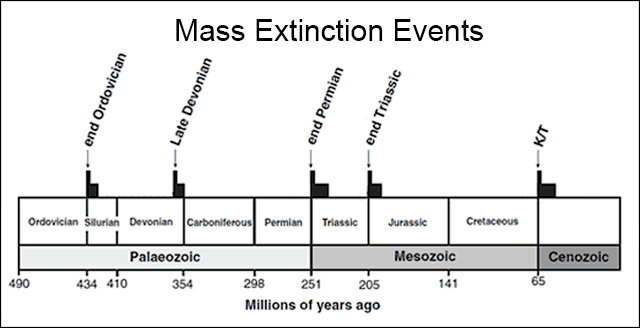 430+ million years ago, the first great mass extinction event took place at the end of the Ordovician, with 60% of both terrestrial and marine life were exterminated. 2. 360+ million years ago in the Late Devonian period second armageddon is probably sum of several extinctions over a short period rather than just one massive one. 70 percent of marine species died but due to long lasting of the multiple events, terrestrial plants and animals were largely unaffected. 3. Third extinction happened 250+ million ago and it was the most devastating one so far. It is nicknamed "The Great Dying" as up to 96% of all species went extinct. Reefs didn't reappear for about 10 million years and everything that exist today is remnant of those 4% who survived it. 4. The end Triassic mass extinction, happened 200+ million of years ago, was the Pangea splitting event due to large amount of volcanic eruptions and lava floods. Around 80% of all land quadrupeds also went extinct in the process of forming Atlantic ocean. 5. The end Cretaceous mass extinction, 65 million years ago, is the most famous dinosaur killer event. Virtually no large land animals survived. 16 percent of marine families, 47 percent of marine genera, and 18 percent of land vertebrate families including the dinosaurs died. In addition to reef records, couple of other studies help and give us more clear picture of what really happened and how exactly all those armageddons came to place at all. The major one is astronomical study of Earth's complex motion over time. 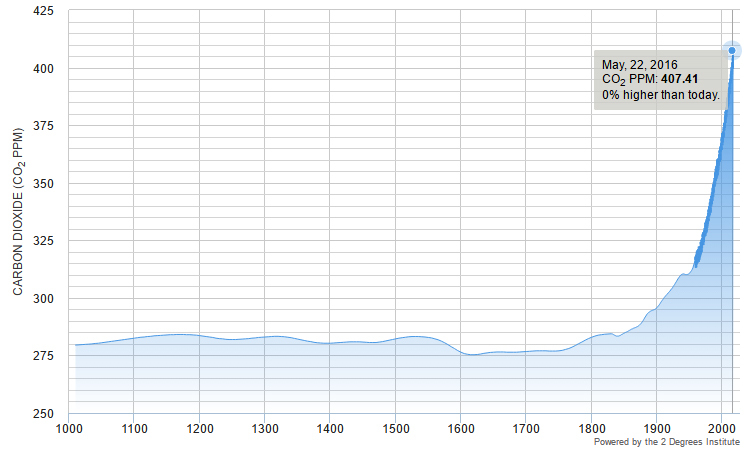 The theory is known as Milankovitch Cycles I wrote about before in post "Ice Age vs Global Warming". In short it summarized several planetary motion that leads in periodical dramatic changes of the climate. The main period is identified as 100.000 years cycle that force our planet to go into glacial periods or what we are familiar with "The Ice Ages". As it seems, reef gaps don't correspond to this cycle at all. They don't even match to the recognized 400.000 years cycle we today know as carbon dioxide variations in oceans but first thing we notice in below chart is the period of more or less 100 million of years between two extinctions. Does there really exist some kind of cycle or it was just a cosmic coincidence, we don't know, but it seems that planetary cycles are not enough to trigger such big event. I am guessing that several conditions should meet in order to make it happen. In addition to regular cycle, the smoking gun could also be massive supervolcanic event or extra-terrestrial collision with large comet or mountain sized rock from space. Recently, and what triggers me to write this post, I read couple of articles that are claiming we are dangerously close or even living in the sixth extinction event that will have the power to get rid of us entirely. I am not really convinced at this point. Of course, there's a fact that many species already vanished due to human activities (like some bird species caused by deforestation or Japanese sea lion that was harvested to the last one by fishermen). The energy needed to sustain all life on Earth is definitely limited but nobody knows exactly where the red line is. According to Dr. Hans Rosling and his research I glimpsed last year in post "Speed of Demographics", nature already started to reduce human population and its peak is supposed to be within next decades from now, considering observed fertility rates so far. After that, human population might start degrading in numbers and be more or less regulated by nature. Same goes with other species that could be following natural equilibrium as well. However, these are just speculations and scientific guesses and it remains to be proven in the near future. On the other hand, industrialization and pollution are two completely different issues. Something we need to take more seriously. They are ultimately dangerous. Perhaps centuries ago, just like the ant from the beginning of the story, humans were also small in numbers, but today we have grown enormously and became considerably and astronomically speaking the most dangerous player for our own home. We saw that smoking gun in couple of previous mass extinctions were large and massive volcano eruptions and/or solar system collisions, but in potential upcoming sixth event, as it seems we would not need any inner or extra terrestrial excuses. CO2 and other greenhouse gases we are keep producing and letting out in the air could be enough. Atmospheric CO2 concentrations that I check two years ago is slightly bigger today and the curve is going up ever since measurement has started. In May 2015 it was 403,70 ppmv (parts per million volume) and it was 150+ ppmv higher than normal. Sixty years ago the number was 320 ppmv. Global warming that is direct consequence of the risen gases in the atmosphere are the least of our worries. Further problem with CO2 is that the entire water in planetary oceans are acting as one giant CO2 eater. It was calculated that ppmv of greenhouse gases should not be over 240±5 ppmv in order for normal glacial-interglacial cycles to function. Substantial increase in CO2 concentration in the atmosphere, over short amount of time, that we are facing right now is dramatically reducing pH of the oceans and it is happening right now. Even if we stop emitting CO2 completely, the process might continue to the point of fatal acidification effects in face of dramatically reduced oxygen in water. And we will have dead corals again. All over the place. Life will try to adapt but whether or not it will be successful, we will definitely bring ourselves a worldwide catastrophe, if not another and this time mortal event with "civilization killer" nickname written all over it.